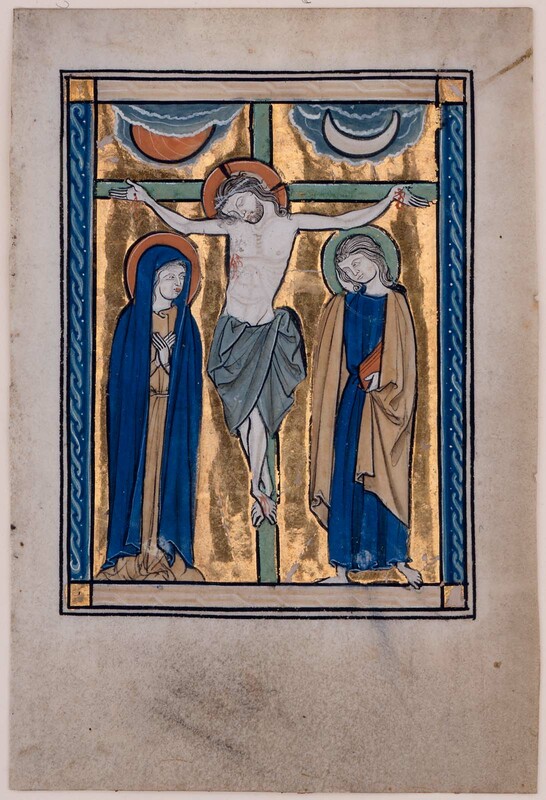 A miniature from a psalter (a book containing a collection of Psalms) depicting the Crucifixion, with the Virgin Mary and John the Baptist. Christ is suspended on the dark green cross, bleeding from the wound in his torso and wearing a green loincloth. The crucifix divides the scene into quadrants, the two at the top much smaller than the two below - clockwise, from upper left, they contain a semi-shrouded orange sun, a crescent moon, John the Baptist in a blue tunic and beige cloak, and the Virgin Mary in a beige gown and blue cloak. The vertical borders of the scene are light blue ropework on a dark blue background, and the upper and lower borders are solid beige. Haloes are orange or green. Gold leaf background. In the late 18th century, Stanislaw Kostka Potocki (b. 1755 - d. 1821), the Polish emissary to Paris, purchased an already incomplete psalter -- known as the Potocki Psalter -- that remained in his family until 1932, when it was sold to the National Library, Warsaw. This miniature has been identified as coming from the Potocki Psalter. It is believed to have been removed by the time of Potocki's purchase in the 18th century, although at what date the removal occurred is not known. Four other miniatures from the psalter, today at the Blackburn Museum and Art Gallery (England), are also thought to have been removed by this early date. See "The Illuminations of the Potocki Psalter from the Wilanów Collection" (exh. cat., Biblioteka Narodowa, Warsaw, 2004), pp. 95-96, 100-101.